El Niño -- which unfortunately still has nothing to do with Chris Farley, and a lot to do with severe flooding in California -- is growing stronger and more powerful by the day. This new image released by the National Oceanic and Atmospheric Administration (NOAA) compares Pacific Ocean sea temperatures from November 1997 (during the last monster El Niño) to now, and shows that the warm ocean water levels are surpassing those of 1997. Great! 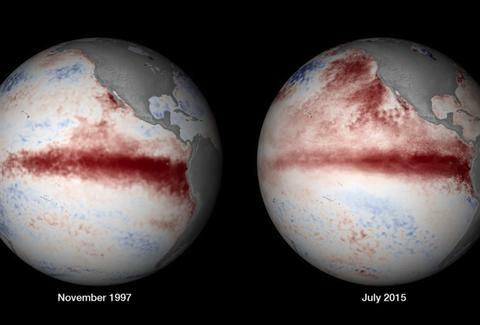 According to the NOAA, "The 1997-1998 El Niño was distinguished by record-breaking warm sea surface temperature anomalies in the equatorial east-central Pacific Ocean. So far in 2015, increasing equatorial warmth is developing alongside a positive Pacific Decadal Oscillation, characterized by persistently higher sea surface temperature anomalies of the northeastern Pacific." That is to say, goodbye California, we hardly knew ye. Just kidding, it'll probably be okay (?). Changes in sea surface conditions are also apparently responsible for recent hot, muggy weather in the Bay Area, as well as an increased number of shark and mountain lion sightings, KRON-4 reports. Though El Niño would bring much-needed rain to California, too much water could be detrimental -- heavy showers in Southern California last Friday caused the elevated portion of Interstate 10 near Desert Center to collapse, and additional hurricanes and typhoons are expected along the Pacific Coast this season. Guess we may as well lean into it and embrace the famous words of one Hilary Duff: "Let the rain fall down and wake my dreams. Let it wash away my sanity." Lucy Meilus is a staff writer for Thrillist and says bring it on, El Niño. Just kidding, sounds super scary. Bye. Follow her on Twitter at @Lucymeilus and send news tips to news@thrillist.com.